If the Library has an electronic version of the article, use a permanent link to the article (eg. in your D2L and/or your syllabus). If the article is available legally on the web, link to the article. If not, you will need to conduct a fair use analysis before scanning or copying the article for your class. Place print copy of a book on reserve at the library. If the Library has the ebook, put a permanent link to the ebook in your readings list. If not, you will need to conduct a fair use analysis before scanning or copying the chapter for your class. If the Library has the ebook, put a permanent link to the ebook in your D2L. YouTube Linking to a YouTube video is permitted. If embedding code is provided, it is fine to embed. Be sure to attribute the creator. Avoid any video that you suspect is not a legal copy, not least because it could be taken down by YouTube at any time. Linking to a YouTube video is permitted. If embedding code is provided, it is fine to embed. Be sure to attribute the creator. Avoid any video that you suspect is not a legal copy, not least because it could be taken down by YouTube at any time. DVD The Classroom exception permits you to show DVDs without limitation, provided that the DVD is legally made and acquired. Streaming a DVD in an online class will need to be permitted by the TEACH Act or be a fair use. The TEACH Act specifically forbids copying an entire DVD. Fair use could conceivably permit it but a very rigorous analysis and justification would need to be provided. Portions necessary to serve your pedagogical purpose may be streamed to students. You will need to think through your purposes for including the content from the DVD and limit your use to only the necessary portions. To request that a DVD be converted to streaming for these purposes, use the media conversion request form. DVDs can also be converted and captioned to accommodate a disability. "The performance of a nondramatic literary or musical work or reasonable and limited portions of any other work”; the DVD must be a legal copy and the content cannot be mediated educational programming. PCC Library-licensed streaming content Yes! PCC has licensed content you can embed in your classes. Films on Demand and Kanopy are our two streaming film collections. Yes! PCC has licensed content you can embed in your classes. Films on Demand and Kanopy are our two streaming film collections. Showing legally acquired images in the classroom is permitted. 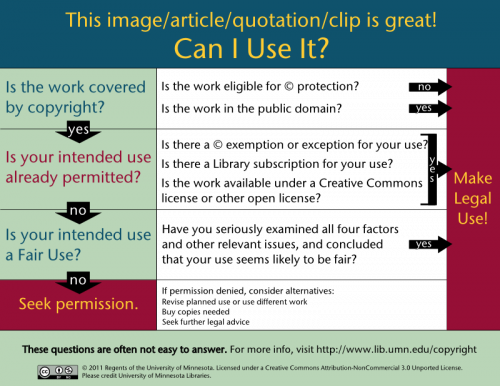 If you post a slide deck to D2L, consider removing any copyrighted material unless you have done a fair use analysis and determined that it is likely to be fair. Consider using the Library's licensed content or Creative Commons licensed content from the web. Creative Commons licensed, public domain, or library-licensed material can be used. Otherwise, you will need to conduct a fair use analysis. Figures, charts, graphs Permissible to use, with attribution. Permissible to use, with attribution. If the chart or graph is creative in it's display of information (as opposed to something that anyone could reproduce exactly given the same data), conduct a fair use analysis. Music from a CD Okay to use. See "DVD" above. Sending content via email It is better to send a link than to send an attachment. Much of the details listed above for posting things online will be similar with email but posting online on D2L will make any fair use argument stronger. It is better to send a link than to send an attachment. Much of the details listed above for posting things online will be similar with email but posting online on D2L will make any fair use argument stronger. Student work Get permission from the student in writing and keep that documentation. Both copyright and FERPA apply. Get permission from the student in writing and keep that documentation. Both copyright and FERPA apply. When trying to determine if you can use given material, try to think systematically about your use, the copyright status of the material you want to use, and the exceptions to the copyright law that might apply to your situation. Does my use exercise one of the exclusive rights of copyright? If not, copyright doesn't come into. For example, if you are simply linking to legal material available freely on the web or in a licensed library database. Is the material I want to use covered by copyright? Most material is but if the material is in the public domain, belongs in a category unprotected by copyright as described above, or was produced by the Federal government, you are probably clear to use it. Once you have determined that copyright will come into play, figure out if your use is permitted by an existing exception (like fair use, the Classroom Use Exception, or the TEACH Act). If so, you can use it legally. When thinking about these exceptions it can be useful to keep in mind that in the face-to-face classroom the two exceptions that are likely to apply are the Classroom Use Exception and fair use. In the online classroom, most often you will be looking to fair use, though in some cases the TEACH Act will apply. If you have determined that your use would exercise one of the exclusive rights of copyright, the work is copyrightable and still under copyright and no exception applies to your use, at that point you will need to seek permission. Remember, we are happy to talk with you and help you think this through! Be in touch!